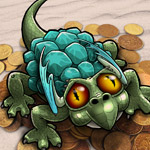 is it possible to turn dragon scales into money? Dragon scales are only good for use with the dragon feature. You cannot trade scales for cash. You can, however, sell 1 adult dragon per month (once it has the required trust percentage for selling). Depending on the dragon, they can be sold for $5, $10, $20, or, for the most rare dragon, $100. The higher paying dragons only pay the maximum amount for the first one you sell, though. After the initial sale, you get $5 per dragon each time after. Hope that helps!